After having won the 1960 NFL Championship and contending strongly in ’61, the Philadelphia Eagles endured last-place finishes in 1962 and ’63. In January of 1964, 37-year-old construction executive Jerry Wolman’s purchase of the franchise was approved by the league and he immediately fired Head Coach Nick Skorich. Saying that he would “hire the best professional coach available”, Wolman conducted an extensive coaching search over the next several weeks. Among those rumored as possibilities for the job were ex-Eagles QB Norm Van Brocklin, who was the head coach in Minnesota; Paul Brown, who had been inactive since being fired by the Browns following the ’62 season; Otto Graham, former star quarterback in Cleveland who was coaching collegiately at the Coast Guard Academy; Weeb Ewbank, ex- Colts head coach now in the AFL with the New York Jets; and a former Eagles coach, Jim Trimble, who was currently coaching in Canada. 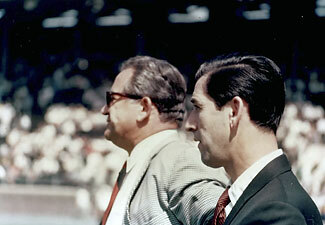 On February 27, 1964 Wolman introduced Joe Kuharich as the new head coach of the Eagles (Kuharich shown at left in picture at top, with Wolman to his right). The hiring raised questions from the start. The 46-year-old Kuharich had most recently been the NFL’s supervisor of officials in 1963, a year after he had left the head coaching job at Notre Dame, where he had compiled a losing record of 17-23 in four seasons. Kuharich, a guard, had played collegiately at Notre Dame and professionally with the Chicago Cardinals before entering the coaching ranks. He was most successful with the University of San Francisco, where his 1951 team went undefeated, before moving on to the Chicago Cardinals, Washington Redskins, and Notre Dame. In one season with the Cards, they went 4-8, and while the Redskins had an 8-4 record in 1955, overall Washington was 26-32-2 in five years under Kuharich’s direction. The unprecedented losing record with the Fighting Irish made his future coaching prospects appear dim. NFL Commissioner Pete Rozelle had been public relations director at the University of San Francisco during Kuharich’s tenure there, where they had become friends, and it was widely rumored that Rozelle had pressured Wolman to hire Kuharich when the coaching job became available. While the rumor was denied by all parties, it poisoned the atmosphere for Kuharich in Philadelphia from the start. Kuharich was initially hired to a four-year contract. When asked if he was concerned about not being Wolman’s first choice, the new coach indicated that “it doesn’t concern me in the least.” Holdover Vince McNally was to remain as general manager, but he resigned just prior to the ’64 regular season. Kuharich’s teams had featured strong running games, but he indicated from the start that he wanted the Eagles to adopt a more wide-open style. He also made a series of major trades that radically reconstructed the roster. Gone were QB Sonny Jurgensen, flanker Tommy McDonald, FB Clarence Peaks, HB Ted Dean, OT J.D. Smith, DB Jimmy Carr, and LB Lee Roy Caffey. In their place arrived QB Norm Snead from the Redskins, C Jim Ringo and FB Earl Gros from Green Bay, flanker Red Mack and DB Glenn Glass from the Steelers, DE Don Hultz and split end Ray Poage from Minnesota, and veteran all-purpose kicker Sam Baker from the Cowboys, who was accompanied by DT John Meyers and offensive lineman Lynn Hoyem in the McDonald trade. In the deal that sent Smith to Detroit, the Eagles obtained promising DT Floyd Peters and aging HB Ollie Matson, who had played for Kuharich at USF. In addition, the Eagles had drafted OT Bob Brown out of Nebraska in the first round and also added highly-mobile QB Jack Concannon from Boston College in the second. There was some fine holdover talent in HB Timmy Brown, who had set records for all-purpose yards in each of the previous two seasons, TE Pete Retzlaff, and MLB Dave Lloyd, among others. The refurbished Eagles started the 1964 season off with an impressive 38-7 win over the declining Giants on their way to a 6-8 record. Snead had a decent year, although when given a late-season opportunity to start against the Cowboys, Concannon put on an exciting show with his flashy running ability while tossing two TD passes. When Timmy Brown went down with an injury, Matson played well in relief. 17th round draft pick Mike Morgan moved into the starting lineup at outside linebacker and undrafted free agent safety Joe Scarpati was a pleasant surprise. Baker even set a new club record with 16 field goals. While the Eagles failed to beat anyone of consequence, they were an improved team and a satisfied Jerry Wolman took the step of signing Kuharich to a 15-year contract as general manager. It was another eyebrow-raising move that would become a point of derision in the years ahead. The team dropped to 5-9 in 1965 as the often-productive offense was offset by a defensive line that, while benefiting from the play of Peters at tackle, was poor at rushing the passer and necessitated a heavy blitzing scheme to compensate, thus putting additional pressure on the backs. The All-Pro linebacker Baughan complained and was dealt to the Rams after the season, soon followed by star CB Irv Cross. The deals highlighted the growing friction between Kuharich and talented veterans with strong personalities that led to questionable trades. His many malapropisms, such as “We’re planning not only for the future, but for the ensuing seasons, too” and “It’s a horse of a different fire department”, combined with his tendency to talk in circles when answering questions from reporters added to the negative perception of the coach. The Eagles put together a surprising 9-5 record in 1966 which belied several glaring weaknesses. First, Kuharich’s handling of quarterbacks, always a source of concern, came to a head as Snead, who had problems with consistency even in his best years, struggled and was benched in favor of backups King Hill and Concannon. Insisting that he had “three starting quarterbacks”, Kuharich often kept the trio in the dark up until game time as to which would be starting. While the running game was effective, with a fine stable of backs supplemented by the exciting Concannon when he was in the lineup, the passing attack suffered accordingly. And while Scarpati enjoyed a good season at free safety, the Eagles were vulnerable defensively to teams with strong passing attacks. Despite the winning record, they were outscored 326 to 340. They earned an appearance in the Playoff Bowl, the postseason exhibition game between second place teams in each conference, and lost to the Colts. Kuharich made more major trades in the offseason, dealing Concannon to the Bears for TE Mike Ditka and Earl Gros to Pittsburgh for flanker Gary Ballman. Snead responded with an outstanding year, but spent much of it on his back as injuries depleted the offensive line, most notably the star tackle Bob Brown. While split end Ben Hawkins had a breakout year, leading the league in pass receiving yards (1265), and FB Tom Woodeshick more than adequately replaced Gros as the starting fullback, the Eagles ended up back under .500 with a 6-7-1 record. The Eagles crashed in an ugly 1968 season that culminated in a 2-12 record and had Kuharich at odds with many of the players, most notably Ditka and Ballman. “Joe Must Go” buttons were worn by disaffected fans who booed the beleaguered coach unmercifully, and the local sportswriters, with whom the coach always had an uneasy relationship, were quick to fan the flames. In the meantime, Wolman had gone bankrupt and was forced to sell the club to local trucker Leonard Tose. Tose fired Kuharich, who had 11 years left on his contract. Joe Kuharich’s overall record in five years coaching the Eagles was 28-41-1 and contained just the one winning season. His legacy of questionable trades and poor handling of personnel overshadowed any successes he had.